Polish physician; born at Zamosc 1788; died at Warsaw Feb. 3, 1879. He began his career as an army surgeon under Napoleon I., who created him an officer of the Legion of Honor. After the close of the Franco-Russian war Lubelski was appointed chief physician of the military hospital at Zamosc. From 1826 he resided permanently in Warsaw, where he engaged in private practise. 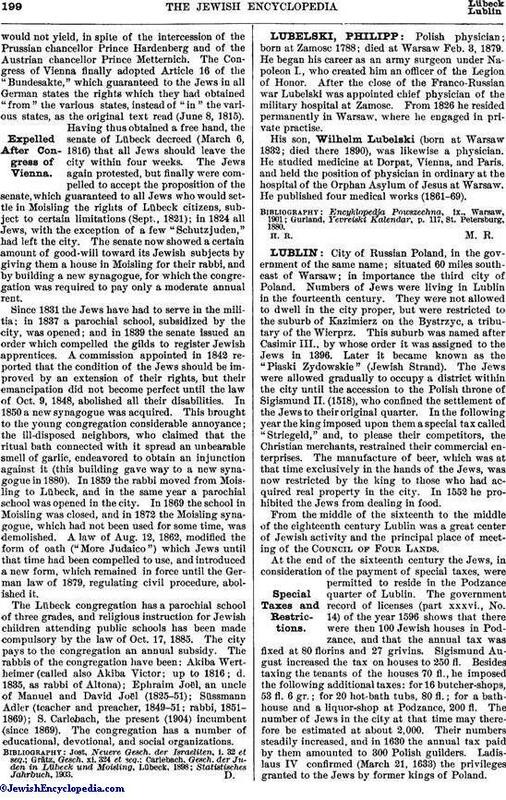 His son, Wilhelm Lubelski (born at Warsaw 1832; died there 1890), was likewise a physician. He studied medicine at Dorpat, Vienna, and Paris, and held the position of physician in ordinary at the hospital of the Orphan Asylum of Jesus at Warsaw. He published four medical works (1861-69). Gurland, Yevreiski Kalendar, p. 117, St. Petersburg, 1880.